Don’t Understand Something? Blame It on Quantum Mechanics! 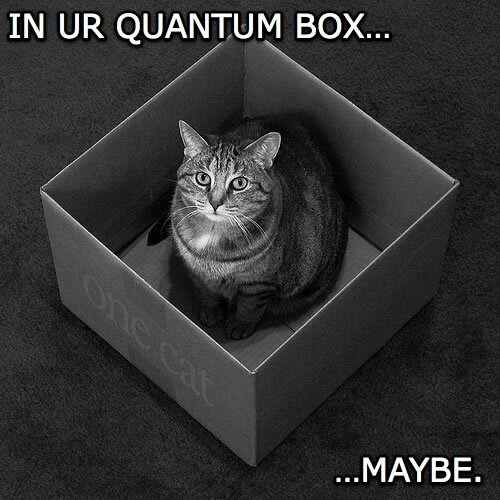 This term, I’m teaching two classes involving quantum mechanics at a fairly high mathematical and conceptual level. It’s a challenging subject to teach, although one I think is fairly rewarding; after all, nearly all of modern physics involves quantum mechanics somehow. I’m actually a rarity in that my research doesn’t directly use quantum theory — I study gravitation and cosmology (but not early-universe cosmology, which does use quantum theory extensively) — but like most physicists I have a thorough grounding in quantum mechanics and its even crazier offspring, quantum field theory. Quantum mechanics is mathematically challenging, but where it gets most people’s attention is in the conceptual weirdness. If a highway patrolman uses a radar gun to gauge your car’s speed, the radar doesn’t affect your car in any meaningful way. However, if you shine light on an atom to study it, you can strongly affect the atom, changing its properties. The interaction between what is being measured — electrons, atomic nuclei, etc. — and the measuring apparatus cannot be ignored. Since there’s no way to determine the properties of a physical system without measurement, the best way we have to understand microscopic systems is through probability. We can’t know for certain, predictability is out the window, so we can only say how likely a particular phenomenon is to occur when dealing with electrons and the like. Even now it probably doesn’t sound so weird to you, but there’s something else missing: it’s difficult in a consistent way to think about an electron even having specific properties like position until you measure it! In other words, the measurement determines the position. If you use an electron gun (like in a cathode-ray television or computer monitor — not an LCD or plasma screen) to shoot electrons at a barrier with two openings, the electrons will appear to pass through both openings simultaneously. Without getting into the philosophical underpinnings any further, you can see why quantum mechanics is considered weird. It’s difficult to understand, to the point where some very wise physicists have said nobody understands it. I certainly don’t claim to understand it (though I think the case is often overstated). However, there’s a tendency to attribute things to quantum mechanics that we don’t understand — or worse, to drift into pseudoscience and frankly incorrect science just because quantum mechanics is tricky. Scott Adams, creator of the comic strip Dilbert, claimed in his book The Dilbert Principle that quantum mechanics allows faster-than-light communication (not true); in Mary Roach’s book Spook, she interviews a gynecologist named Gerry Nahum who uses a bizarre mixture of quantum information theory and thermodynamics to “prove” that the soul must exist and have measurable energy (perhaps true, but I’m inclined to think Nahum’s science is questionable). New Agers, psychics, and bad sci-fi writers will evoke quantum mechanics to explain anything from telepathy to time travel. So let me say it plainly: we understand how quantum mechanics works, even if we don’t fully understand why. It’s an interesting and worthwhile area of study, but as with so many other things, if a particular claim seems far-fetched, it may be. Quantum mechanics is weird, but after nearly 100 years of study, we can rule out some of the stranger claims made of it. Ignorance is not an excuse. I think we have some similarities in psychology, in terms of a number of replicated observations of strange phenomena, which we don’t know exactly why they happen. But I think we are so used to not knowing either the how or the why, that we are pretty happy with a few scattered hows. In psychology, the basic system is a human being: a rather complicated thing. Though in lots of ways humans are alike, we have a lot of variety born of both genetics and environment. I think what trips many people up about quantum mechanics is that a baseball (an object made up of many many many atoms) is actually less complicated in many ways than an electron, which seemingly should be simple — it has no size, it’s fundamental (not made of anything else), and of course it’s a very common thing. Every electron is identical to very other.